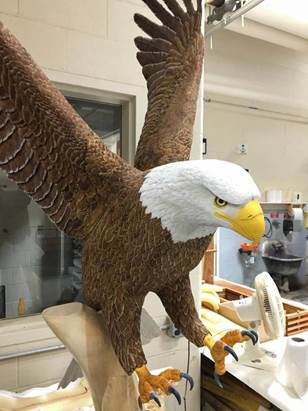 This hand-carved 7-foot-tall American Bald eagle will be presented on Nov. 12. AUGUSTA — VA Maine Healthcare System invites the public to a Veterans Day celebration 8-9 a.m. Monday, Nov. 12, at the main hospital’s lobby and at flagpole at 1 VA Center, on the Togus campus. Randall Liberty, a veteran, former sheriff of Kennebec County and current warden of the Maine State Prison, will present a 7-foot-tall American Bald Eagle hand-carved by an incarcerated master craftsman, to be dedicated to the Honorable Veterans of the State of Maine. The craftsman spent four months and approximately 1,600 hours carving each individual feather, each talon and the beak. Warden Liberty has done a lot of work for Maine veterans, including establishing an American Legion Post in the Maine State Prison veteran pod, as well as transitioning to civilian life through advocacy, programming and the Veterans Court.